I don’t know about you all, but I can’t stop buying mangoes, and, of course, eating them. I love mangoes cut up in cottage cheese for breakfast, dashed with a little ground chile for a midday snack -- a la the cut fruit vendors I so loved in Los Angeles -- and eaten over the sink with nothing but a knife and a napkin, as I try to salvage every meaty yet slithering chunk of sun. Mangoes were my children’s gateway tropical fruit. Bacon girl sadly went on to eschew all fruit not disguised in pancake batter, but the incipient pescatarian who learned the ways of lamb and never looked back continues to love mangoes. I often put them in her packed lunch or mix them into her morning smoothie. Finally there is the husband, who does not drink alcohol and treats himself to a mango lassi at Indian restaurants when others at the table are ordering Kingfishers. Perhaps you feel I speak too ostentatiously about the mango, defending a vitamin C powerhouse that needs no further PR campaign. 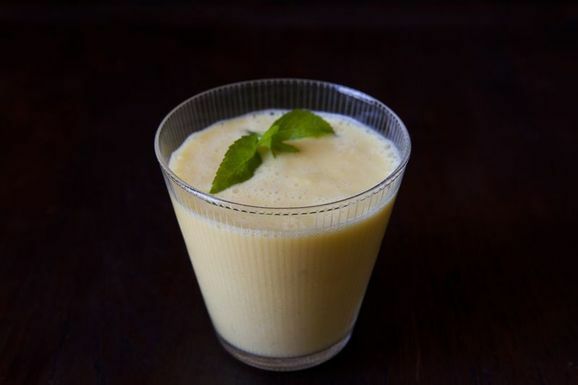 Very well then, here is the recipe: Mango Lassi - Indian Mango Smoothie, which is nothing terribly complicated or representing an unheard of idea for most of you. Instead, I am offering a dash of inspiration that would indeed work well on a mango promotion site, except that I would really have to seriously object to wearing a large white flower in my hair as I championed the idea of the mango lassi for breakfast. I would like to say that any habit or peccadillo my husband brought into this marriage (um, no, I was not aware you planned to referee five soccer games in Northern Virginia on Saturday and would be using the car for seven hours) has been completely offset by his recent purchase of the expensive and totally unnecessary Vitamix blender that now sits on my counter. If you love a cook and owe them a present, get this. But even in your standard blender, this mix of milk, yogurt, ice and honey will be zipped together in less than a minute, and the next thing you know you’ll be ready for a big day at the office, or curling up with a V.S. Naipaul novel. That’s your business. I made two optional changes to this recipe, and they are to taste. I reversed the amount of milk to yogurt (plain full fatted please, I used Brown Cow because I could not find my beloved Blue Ridge) because I like a thick smoothie. Instead of honey, I opted for a quarter teaspoon of cardamom, just to give it a little special flair. A sprig of mint is of course also optional; drinking to your heart’s desire, as rmansuri suggests, required. We have a mango smoothie almost every night. Definitely add cardamom. I tried nutmeg but it is not as good in my opinion. I also add flax oil so we get our Omegas and it does not impact the flavor at all. Sometimes if I am feeling adventerous, I will add water kefir (lots of probiotics) and some low carb ice cream. Currently I am making Filmjolk yogurt and it makes the best smoothie I have ever had. Filmjolk is so easy. It is a mesophilic culture and cultures on the countertop with no appliance needed just an ambient temp of 68 to 78 degrees F and out of drafts. It is very thin, not like Greek yogurt but delicious! Jenny, this portion should read :..... and eaten over the sink with nothing, no knife and no napkin, as I try to salvage every meaty yet slithering chunk of sun! :-). In defense of the mango, this shines brilliantly. Assuming, it needed defending! Thanks for sharing, plus the inspired hand of cardamom. I love how you write. Must make soon. Btw: bet you've made Chef Gwen proud. J -thanks for the follow up. Ok...you are persuasive...headed to the fruit stand. Just to clarify, you used about 3/4 cup yogurt and 3 tablespoons or so of milk? I too like thicker smoothies. Thanks.